The devastating effects of poverty are accelerating. Poverty affects both you and your students in multiple adverse ways. You have the power to reverse the academic impact poverty has on your students—and this comprehensive resource will show you how. 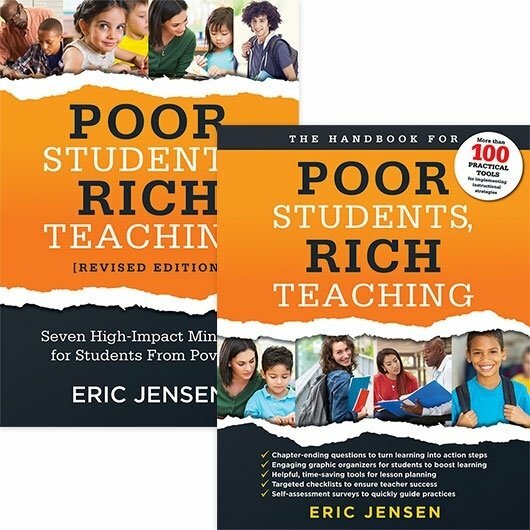 In this revised and updated edition, two of Eric Jensen’s top-selling books—Poor Students, Rich Teaching and Poor Students, Richer Teaching—have been merged into one must-read resource on poverty and education. Dr. Eric Jensen clearly defines seven mindsets essential for reaching economically disadvantaged students and shares corresponding strategies for overcoming adversity and ensuring college and career readiness for all learners, regardless of socioeconomic status. Understand the urgency of poverty in the United States and how poverty affects education, student engagement, and academic achievement. Learn how creating a positive school culture and a growth mindset for students can be beneficial in overcoming adversity. Gain seven high-impact mindsets that bring change: the relational mindset, achievement mindset, rich classroom climate mindset, engagement mindset, positivity mindset, enrichment mindset, and graduation mindset. Build effective teacher–student relationships, and help students see college and career readiness as a reachable target. Create a welcoming classroom climate where all students love to learn, and drive student engagement, motivation, and success. This book’s major theme is developing greater awareness and action to engage students with a different mindset. It is also about something that many poor students are not getting: rich teaching. Here, the word rich means full, bountiful, and better than ever. Teachers can make a difference in students’ lives with richer teaching. Every student that you help graduate means one less dropout, which means one less student at risk for entering the juvenile justice system, depending on welfare, or going to prison (Latif, Choudhary, & Hammayun, 2015). It’s also one more voice that will contribute to our culture and world, making it a better place. You can ensure all students, regardless of background, graduate college and career ready. All of us have narratives in our head about teaching. Teachers who struggle with poor students often have mentalities that reinforce scarcity, blame, and negativity. For example, a teacher may say, “Last year, I just couldn’t make any progress with Jason. You know, those students just don’t get any parental support, so what can I do?” Notice how the teacher ends with a story about why he or she couldn’t make progress. 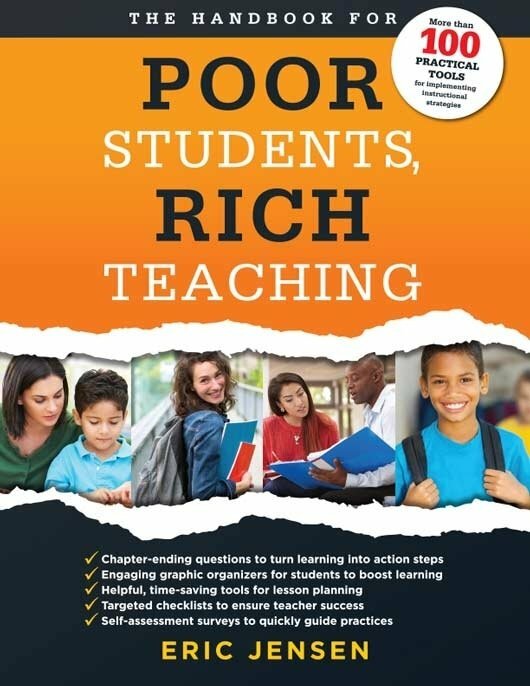 In this book, you will discover the rich strategies that high-performing teachers use to alter the course of these destructive narratives and help students succeed through richer and more abundant teaching. Year after year, your K–12 Title I school culture either reinforces hopelessness and assumptions that the deck is simply stacked against you or it fosters optimistic possibilities and successes with uplifting narratives. I could fill this book with stories of real high-poverty schools that are succeeding, as I have done in other books. Yet, how many schools would you need to read about before you say, “OK, that’s enough. I believe it”? I hope reading this book helps to reframe any negative narratives you struggle to carry. Yes, poverty is a big problem. But committed teachers and whole schools across the country are finding that equity is the solution. This book is all about fostering equity for all by fostering the same success mindsets for all students. Where equality at school gives all students the same treatment, equity gives all students access to the same opportunities. Here are two examples, from two different grade levels. In elementary school, many teachers have a deficit mindset, thinking that students from low-income families don’t have the smarts for higher-level cognitive thinking. That’s a big mistake. Many successful K–5 schools offer computer coding at school. There are dozens of free apps that teach coding starting at a first-grade level (which builds processing speed, memory, thinking, and decision making) in a fun, game-like format. This is an easy way to offer equal access to the opportunities that students from middle- and upper-class families get. Considering the booming job market that needs coders, that’s nearly criminal to not teach coding. Many secondary schools use programs to build college readiness. But some school leaders have decided that their students from poverty are not qualified, leaving many students without the resources that quality programs provide. That’s not equity. There are many secondary schools that do put 100 percent of their students in this program. They may need to provide some additional tutoring, but the mission is the same—success for all. Yes, your mindset does matter, and it matters a lot. The measuring stick is equity. My advocacy is for teachers like you. I’ll do anything to help you grow and succeed. I see teachers as the single most critical factor in helping the United States survive and thrive. Regardless of what our policy makers do, we all need tough, gritty teachers who are willing to make hard choices to help students from poverty succeed. To kick things off, we’ll take a quick tour of how I’ve organized this book and then support the need for its mindsets and strategies with a look at the new normal as it pertains to poverty, its effect on students, and why you can change their futures for the better. 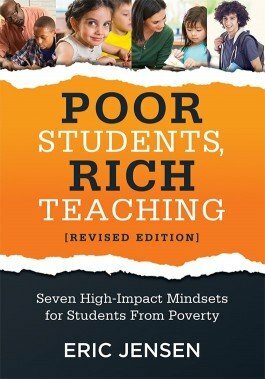 This book combines and updates the best of two books—Poor Students, Rich Teaching and Poor Students, Richer Teaching. For this edition, I included the most critical knowledge from each of the seven high-impact mindsets in both of those books so that you’ll have access to one effective and research-driven resource that contains all the tools you need to improve your teaching mindsets and help all your students in need to graduate. Even if you have been successful before, my promise is that through this book, you’ll become a richer teacher. To complement this book, I’ve also written a companion book, The Handbook for Poor Students, Rich Teaching (Jensen, 2019), which offers a condensed version of this content, but in place of the detailed research content on why these strategies are effective, the handbook adds in a host of reproducible tools for nearly every strategy that you can use to support and shape your evolving mindsets. To change students’ lives, you will have to change before any worthwhile change shows up in your students. I’m not telling you the path of change is easy; I’m telling you that it can be done, and you can do it. This book’s major theme is developing the most powerful tool for change: mindset. A mindset is a way of thinking about something. As Stanford University psychologist Carol Dweck (2008) explains, people (broadly) think about intelligence in two ways: (1) either you have it or you don’t (the fixed mindset), or (2) you can grow and change (the growth mindset). In the areas of intelligence and competency, you may have more of a fixed mindset (stuck in place) or a growth mindset (capable of changing). Those with a fixed mindset believe intelligence and competency are a rigid unchangeable quality. Those with a growth mindset believe that intelligence and competency can develop over time as the brain changes and grows. This book broadens and deepens the mindset theme to many new areas of student and teacher behaviors that you’ll find highly relevant. It continues in seven parts, each highlighting a specific mindset, its supporting research, and some easy-to-implement and highly effective strategies you can use immediately. Here are the seven parts. Part one: The relational mindset—Chapters 1 through 3 explore the relational mindset and begin to discover why the types of relationships teachers have (or don’t have) with students are one of the biggest reasons why students graduate or drop out. Everything you do starts with building relationships with your students. Part two: The achievement mindset—Chapters 4 through 6 teach you about powerful success builders with the achievement mindset. Students from poverty can and do love to learn, when you give them the right tools. Part three: The positivity mindset—Chapters 7 through 9 home in on your students’ emotions and attitudes. Each chapter focuses on building an attitude of academic hope and optimism in both your students and yourself. If you’ve ever put a mental limitation on any student (don’t worry, we all have), these chapters are must-reads. Your new, rock-solid positivity mindset will help your students soar. Part four: The rich classroom climate mindset—Chapters 10 through 12 offer strategies to take all that positivity you’ve generated and use it to create an energetic, high-performing class culture, using the rich classroom climate mindset. You’ll learn the secrets that high-performing teachers use to build an amazing classroom climate. Part five: The enrichment mindset—Chapters 13 through 15 focus on building breakthrough cognitive capacity in students. A big problem for students from poverty is their mental bandwidth, often known as cognitive load. Here, you’ll see the clear, scientific evidence that shows, without a molecule of doubt, that you can ensure your students build cognitive capacity in the form of memory, thinking skills, vocabulary, and study skills. Part six: The engagement mindset—Chapters 16 through 18 dig into student involvement in a new way with the engagement mindset. You’ll gain quick, easy, and practical strategies for maintenance and stress, for buy-in, and to build community. Part seven: The graduation mindset—Chapters 19 and 20 help you focus on the gold medal in teaching: students who graduate job or college ready. Each chapter centers on school factors absolutely proven to support graduation. You’ll learn the science of why these factors can be such powerful achievement boosters, and you’ll discover a wide range of positive alternatives to what your students are doing at school. Each part ends with a Follow Through section that asks you to consider your personal narrative in light of what you’ve read about the featured mindset and reflect on how you can use the mindset to improve your teaching practices. There’s much more for you to learn, but these seven mindsets and the accompanying strategies will make a world of difference if you implement them well. That’s my promise. This book ends with an epilogue that offers a quick-read summary of the book and offers organization tools for immediate application. On this book’s website, you’ll be able to access three appendices with useful resources to support your implementation of the book’s tools, some tips on the important process of running your own brain, and a guide to rich lesson planning. This powerful book is packed with real science and real teachers using powerful strategies, and it absolutely will support you in making fresh, smart choices in teaching. As you read it, it will be up to you to pause and reflect often. Any single chapter can make a difference in your work. Ask yourself not, “Have I heard of this before?” but instead, “Do I already do this as a daily practice?” and “Do I do this well enough to get the results I want or need?” The fact is that all of us can get better. This book can take you down that path. Before we get into part one and all seven mindsets for change, let’s briefly look just a little deeper at the research that supports them and why you can believe in them. Books for educators typically just tell teachers what to do. This one is different because I explain why the suggestions in this book are relevant, important, and most of all, urgent. If you grew up in the United States, I know first-hand how many changes you’ve seen in your lifetime. If you live in another country, no doubt you have seen disruptive change as well. Many of the changes you must learn to regard as the new normal. We typically say something is normal meaning it’s just fine and pay less attention because we often take it for granted. We also say things are normal as if that is a good thing. But now I invite you to see the new normal as a threat to your job and your future. Poverty and mindsets (the topics of this book) play a big part in this new normal. This is no doomsday scenario. It is about what has already happened. You must understand this before you walk into your classroom again. At one school I was working with, a teacher shared some pretty serious frustrations. As she spoke, her eyes moistened, “You want us to do this and that, plus you say it might be hard—and it might even take months or years! For starters, do you even know how much we are being asked to do these days? Do you know how little support we get from leadership? How do we even know these things you suggest are possible? And, really, why should we even bother? After all, things will change again in a few years, and there’ll be some new flavor of the month that we all have to jump on board with again!” She was nearly in tears, and her pain was obvious. When teachers tell me, “Our jobs have changed,” they’re right. When teachers tell me, “Students aren’t like they used to be,” they’re right. When staff tell me, “The whole profession has changed,” they’re right. Lastly, when teachers like you tell me how frustrating their jobs are, I’m on your side. I’ve been a teacher. I work with teachers, and I know the profession well. So, let’s use that. Let’s drill down and learn some of the most relevant changes affecting your classroom when we talk about students from poverty. We’ll examine the hard evidence of the new normal, what the resulting poverty means to you, and how poverty may affect your students. Poverty in the United States is getting worse, not better. The new normal is this: we now have a majority of students in public schools who qualify as poor based on school data (Suitts, 2015). In the five most populated states (California, Texas, Florida, Illinois, and New York), 48 percent or more of public school students are in poverty (Suitts, 2015). Pause and wrap your head around this. But it gets worse. In 2016, two out of three student dropouts were from low-income families. Across the country, the graduation gap between the poor and non-poor ranged from 3 percent to 24 percent. Nationwide, although many states have closed the graduation gap, almost one third of all states have seen increases in the gap (DePaoli, Bridgeland, Atwell, & Balfanz, 2018). This new normal is a mindset game changer for everyone, especially educators. The trend is not our friend. Also part of the new normal is the disappearing middle class. Gone are many good-paying jobs that required a high school diploma and hard work (manufacturing, mining, automobiles, oil and gas, and more). Technology (robots, automated software and websites, and smartphones) has replaced people for many of those jobs. Trucking is the most popular job in twenty-nine states (Bui, 2015). But around the world, multiple manufacturers are actively developing, testing, and deploying automated trucks, so those trucking jobs may be eliminated as soon as 2030 (Campbell, 2018). Imagine the disruption this will cause: the number-one job in over half the states will be automated (Bui, 2015). Often, poverty occurs when the cost-of-living increase does not keep pace with inflation, and real wages for the middle class and poor go down. Real middle-class annual wages (adjusted for inflation) have declined dramatically, from $57,000 a year in 2000 to just under $52,000 in 2014 (Economic Policy Institute, 2014). That means the average U.S. household has lost nearly 10 percent in wages to inflation since 2000. Even for the declining middle class, life has gotten harder and 2018 brings few signs of positive change (Drum, 2018). This is the new normal, and you’re not alone. Roughly 76 percent of Americans are living paycheck to paycheck, with essentially zero savings (Bankrate, 2012). The number of people on food stamps has doubled between 2008 and 2014 (U.S. Department of Agriculture, Food and Nutrition Service, 2016). About half of all children born in 2015 will be on food stamps at some point in their lives (Rank & Hirschl, 2015). Over half (51 percent) of all American workers make less than $30,000 a year. 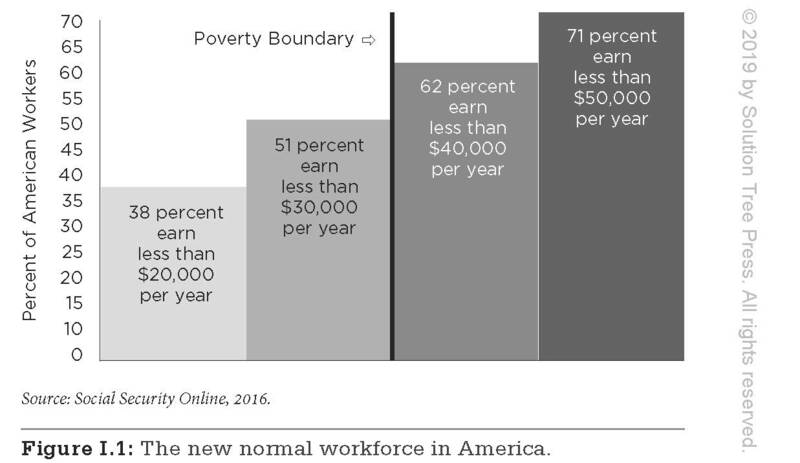 The federal poverty level for a family of five is $28,410, and yet almost 40 percent of all American workers do not even bring in $20,000 a year (Social Security Online, 2016). See figure I.1 for a breakdown of the new normal workforce. Figure I.1: The new normal workforce in America. Let me summarize this for you. From 2000 to 2014, the share of adults living in middle-income households fell in 203 of the 229 U.S. metropolitan areas. Think about that; in almost 90 percent of the United States’ metro areas, the middle class is shrinking (Pew Research Center, 2016). However, understanding all this is only where our battle begins. We must understand what poverty is in real terms. Saying that someone is from poverty tells us nothing about the family. Is it fragmented or intact, caring or careless? We don’t know because, on the surface, all poverty means is having a low socioeconomic status, but it does not define the individual. My own definition is less focused on federal standards for annual income. Instead, I focus on the common effects of poverty via an aggregate of risk factors. Here’s how I define poverty in this book: poverty is a chronic condition resulting from an aggregate of adverse social and economic risk factors. Working with students from poverty means you’ll need to deeply understand what is going on around you. In short, many poor students are different because many of their experiences are wiring their brains differently. The brain’s neurons are designed by nature to reflect their environment, not to automatically rise above it. Chronic exposure to poverty affects the areas of the brain responsible for memory, impulse regulation, visuospatial actions, language, cognitive capacity, and conflict (Noble, Norman, & Farah, 2005). Evidence suggests the brains of children from poverty are more likely to differ via four primary types of experiences: (1) health issues from poor diet and exposure to toxins and pollutants, (2) chronic stress, (3) weaker cognitive skills, and (4) impaired socioemotional relationships (Evans & Kantrowitz, 2002). Although not every single child from a household with a low socioeconomic status will experience all of these factors, the majority will. Teachers who do not know what these behaviors really are may inappropriately judge a student as lazy, unwilling to follow directions, a poor listener, low achieving, and antisocial. This may foster classroom friction, a huge achievement gap, annoyed students, and even dropouts. And worse yet, the teacher may blame the behavior on the student. Conversely, when students feel a connection with their teachers and feel respect and trust, they behave and learn better. Student-teacher relationships have a strong effect on student achievement and are easily in the top 10 percent of all factors (Hattie, 2009). Relationships between students and teachers are more important to students who don’t have a loving parent at home. For comparison, teacher subject-matter knowledge is in the bottom 10 percent of all factors (Hattie, 2009). Students care more about whether their teachers care than what their teachers know. As an educator who works with schools all over the United States, I’ve heard just about every story there is about why students from poverty supposedly can’t succeed. In rural Kentucky, I hear about coal mine closings that are causing student hopelessness. In New Mexico, I hear about how a lack of jobs fosters low expectations in students. In Hawaii, I hear about the beach culture that supposedly makes students more interested in surfing than learning. These, and many like them, are the devastating community-driven narratives that are killing the chances for student success. Likewise, you may know someone who has the impression that people don’t change. In other words, some people spread lies like, “A student who is a troublemaker at age eight will always be one.” This is also an example of a toxic mindset. Do you see the pattern? The fact is, humans can and do change. One of the more relevant properties in the human brain when it comes to teaching students is neuroplasticity. This property allows the human brain to make new connections, develop whole new networks, and even remap itself so that more (or less) physical space in the brain is used for a particular task. For example, there are changes in brain activation specifically associated with the practice of high-level cognitive skills (Mackey, Singley, Wendelken, & Bunge, 2015). Even just two hours of cognitive training shows changes in the brain (Hofstetter, Tavor, Moryosef, & Assaf, 2013). When people don’t change, it is often because others have given up on them, their daily environment is toxic, or others are using an ineffective strategy that doesn’t help. Often, teachers feel helpless to help students if there is a lack of support at home, but the truth is the classroom teacher is still the single most significant contributor to student achievement; the effect is greater than that of parents, peers, entire schools, or poverty (Hanushek, 2005; Rivkin, Hanushek, & Kain, 2005; Rockoff, 2004). Research also shows that above-average teachers (those who get one and a half years or more of student gains per school year) can completely erase the academic effects of poverty in five years (Hanushek, 2005). The stories at your school that are told and retold shape students’ expectations. When the stories are upbeat, affirming, and hopeful, the students and staff reinforce a positive message. In successful schools, staff members try to redefine their new normal. Mindsets matter a great deal, especially when addressing poverty. This book will help you identify the useful and powerful mindsets that can accelerate positive change to alter the future for your students. Before we dig in, there is one last thing you should know about the strategies that enforce these mindsets. In most sports, the team that scores the most points (or goals, runs, and so on) wins. This scoring system is simple and easily understood. In our profession, the scoring system that decides a winning classroom strategy is called the effect size. This number is simply the size of the impact on student learning. In short, it tells you how much something matters. The mathematics on it is simple: it is a standardized measure of the relative size of the gain (or loss) in student achievement caused by an intervention (versus a control) (Olejnik & Algina, 2000). See figure I.2. Figure I.2: Effect sizes made practical. Researchers simply measure the difference between doing something and doing nothing. Ideally, one uses an experimental group (using a new strategy) and a control group (using an existing norm). The strongest analysis includes large sample sizes and multiple studies with varied population demographics. Then, you know your data are very, very solid. This is important to you, and I connect many of the strategies in this book to their expected effect size, so please lean in and read closely. This is all about your teaching. 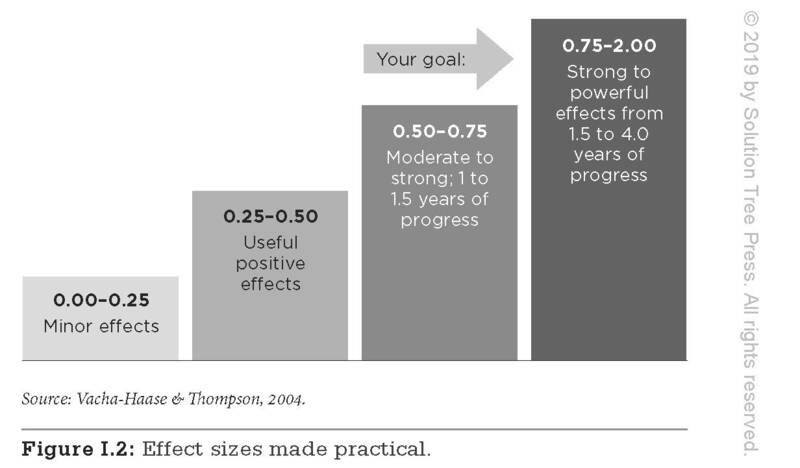 Effect sizes are a common research-based way to measure the impact of a strategy or factor. While any intervention could have a negative effect size, most classroom interventions (teacher strategies) are positive. Classroom interventions typically have effect sizes between 0.25 and 0.75 with a mean of about 0.40 (Hattie, 2009). One full year’s worth of academic gains has a 0.50 effect size, and two years’ worth of gains have a 1.00 effect size. This means that effect sizes above 0.50 are just the baseline for students in poverty. Teachers have to help students catch up from starting school one to three years behind their classmates, and it takes good instructional practices for effect sizes to be well above 0.50. To ensure students from poverty graduate, you’ll want to teach in ways that give them one and a half years’ worth of gains (or more) in each school year. What if, by just replacing one strategy you already use (for example, saying “Good job!” to a student) with another (a far more effective one, like “Your steady, daily studying really paid off. That’s going to help you graduate on time!”), you could get five to ten times the positive effect on student achievement? I show you how to do that in this book. Think about the impact you can have every single workday by switching out less effective strategies with more effective strategies. In fact, I’m going to invite you to slowly replace those things you do that are sort of effective with strategies that are ridiculously effective. If you want even more support in effecting this change, with real tools you can access and use to implement these strategies, I provide them in The Handbook for Poor Students, Rich Teaching (Jensen, 2019). Yes, I am on a mission to help you become so effective that it changes the course of history for your students. With this goal in mind, and a wealth of strategies at your disposal, it’s time for you to take stock and reflect on your own mindset.